To Cite: Emami S M, Mirmohamadi P, Jafarzadeh Esfehani R. Skin and Soft Tissue Infection as a Complication of Varicella Infection Ended up in Using Intravenous Immunoglobulin Instead of Surgical Debridement: A Case Report and Short Review of Literature, Arch Clin Infect Dis. 2017 ; 12(4):e66108. doi: 10.5812/archcid.66108. Introduction: Varicella infection is a vaccine-preventable infection, which can result in different complications. Necrotizing fasciitis (NF) as a skin and soft tissue infection is a rare complication of varicella infection in childhood. Early diagnosis and treatment of necrotizing fasciitis can save life. Surgical debridement along with appropriate antimicrobial treatment is very common. However, some patients cannot undergo surgeries and physicians should try other options. Case Presentation: A 6-year-old male with a history of chicken pox infection was admitted due to abdominal pain and fever. On physical examination, abdominal tenderness and diffused erythema on the entire abdomen as well as crepitation was prominent. As acute abdomen was ruled out by abdominal sonography, the patient received antimicrobial treatment, which was ineffective. Meanwhile, his hemodynamic condition worsened and sign of scaly skin presented, antimicrobial regimen was changed and surgical consultation was ordered. Unfortunately, surgical debridement was impossible due to extensive tissue involvement. Intravenous immunoglobulin (IVIG) was initiated and patient was transferred to the intensive care unit (ICU). Within 72 hours of administering IVIG, skin erythema and abdominal pain decreased and on the 10th day of admission, the patient became afebrile and healthy. Antibiotics were discontinued on the 12th day and the patient was discharged in good conditions. Conclusions: Although tissue debridement is the cornerstone to treat necrotizing tissue infection, in some cases patients might benefit from adjuvant treatments such as IVIG. Although this treatment cannot be generalized to every patient, it may be concluded that physicians can save surgical options and try IVIG under close clinical observation to avoid possible multiple surgical debridement. Varicella zoster virus (VZV) is an alphaherpes virus, which causes 2 well-known diseases; chicken pox and shingles (1). Varicella is a highly contagious and vaccine preventable infection (2). Most of varicella infection complications occur in otherwise healthy children could be prevented by immunization (2). Even healthy children can develop sever complications of VZV infection (2). These complications can be categorized into infectious and non-infectious complications. Superinfection of skin, pyogenic arteritis, osteomyelitis, and necrotizing fasciitis (NF) are considered as the infectious complications (3). NF, as a complication of VZV infection, requires close attention especially in children (4). This disease should be managed by appropriate and timely antibiotic administration as well as early possible surgical debridement and close clinical care. Although the need for surgical intervention is not always clear, surgical management should be considered in case of clinical suspicion (5). Immediate surgical intervention is considered as the most reliable treatment; therefore, non-surgical treatment of NF is not a routine medical plan and is chosen when surgery is not possible (6). The current report discussed a case of NF in a 6-year-old male following chicken pox infection managed by nonsurgical approach. A 6-year-old male was admitted to the Pediatric Emergency Department due to colicky abdominal pain from 2 days ago not subsided by ibuprofen. The child had just developed persistent nausea and vomiting, which was not bloody or bilious. In his medical history, previous VZV infection was remarkable. Primary VZV skin lesions appeared 10 days earlier and vesicular and crusted lesions were visible over the entire body at the time of admission. Furthermore, defused erythema as well as vesicles were prominent on abdomen and both flanks. The patient did not take any medications from the initiation of skin manifestations except ibuprofen. At the time of admission, the child was ill and toxic. Vital signs were as follows: systolic and diastolic blood pressure 90 mmHg and 60 mmHg respectively; axillary temperature 39°C; respiratory rate 55 breathes per minute; and pulse rate 120 per minute. In the physical examination, head, neck, and extremities examination were unremarkable. There was no cardiac murmur, and pulmonary auscultation was normal. Sever tenderness and diffused firm erythema on the entire abdomen and abdominal crepitation was prominent. Due to possible diagnosis of acute abdomen, an emergent abdominal sonography and surgery consultation was scheduled. However, the ultrasound (US) evaluation ruled out acute abdomen and suggested possible cellulitis or fasciitis of abdominal wall. Based on the possible diagnosis of defused fasciitis, the surgeon recommended medical treatment and close clinical observation. The patient was hydrated and intravenous ceftriaxone and clindamycin were started. Although the patient did not tolerate oral feeding due to nausea and vomiting, intravenous acetaminophen was used to control the fever. 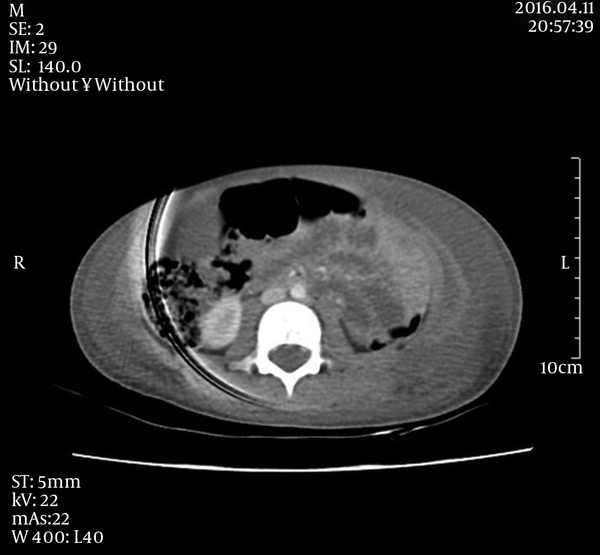 As the patient’s clinical condition did not improve over several hours, a computed abdominal tomography (CT) was performed on the patient. CT scan revealed cutaneous edema as well as free fluid in flanks (Figure 1). After 48 hours of the commencement of antibiotics, patient’s condition did not improve and fever persisted; therefore, antibiotic regimen was changed to meropenem and vancomycin. Remarkable laboratory tests were as follows: creatinine: 0.5 mg/dL (normal range: 0.7 - 1.4 mg/dL), erythrocyte sedimentation rate (ESR): 45 mm/h, C-reactive protein (CRP): ++ positive, albumin: 2.6 g/dL (normal range: 3.5 - 5 g/dL), and white blood cells (WBC): 10,000/uL (neutrophil percentage: 60). Blood samples were obtained from 2 different venous sites and cultures were also negative. Gradually, signs of scaly skin presentation were emerged on abdomen and extremities (Figure 2). After 72 hours, the patient’s clinical condition aggravated, the systolic blood pressure dropped to 40 mmHg and the body temperature raised to 39.3°C (axillar temperature). Patient was diagnosed with toxic shock and dopamine was initiated and intravenous immunoglobulin (IVIG) (1 g/kg) was also administered. The patient was not a candidate for surgery due to unstable clinical condition and extension of lesions. On the 4th day, while scaly skin and abdominal tenderness were still apparent, clinical condition of the patient improved (systolic blood pressure raised to 90 mmHg and diastolic blood pressure to 60 mmHg). On the next day, the patient tolerated oral feeding and vital signs turned back to normal ranges except for body temperature (39°C axillary). On the 6th day of admission, abdominal erythema was localized in left side of abdomen and despite mild abdominal pain and tenderness the patient was able to walk independently. In the follow-up abdominal sonography, similar to the first one, cutaneous edema and free-fluid in flanks were reported. According to localized skin erythema and improvements in patient’s clinical condition and rise of ESR, CRP, and persistent fever, the surgeon advised surgical fasciotomy. However, the patient’s parents did not consent for any surgical intervention owing to the improvement of the patient’s condition and ability to walk. Thus, previous medications were continued. Abdominal pain diminished gradually and fever diminished on the 10th day of admission. On the next day, intravenous antibiotics were discontinued and on the 12th day, despite elevated CRP levels and positive CRP test, the patient was discharged in good conditions and was advised to refer for a follow-up visit a week later. On the follow-up visit, the patient was healthy and afebrile with normal ESR and CRP levels. Figure 2. Abdominal Axial Computed Tomography Shows Soft Tissue Edema in Abdominal Wall Over the Erythematous and Severe Tender Skin. VZV infection is responsible for at least 6 reports of death and 103 sever complications per year in the United Kingdom and Ireland (2). NF is an important and rare complication of VZV infection, which requires immediate diagnosis and treatment (4). The diagnosis of this critical medical illness is difficult in children (5). Diagnosis is mostly clinical and the most common symptom of NF is an intense pain, which is disproportionate to examination (7). Warmth, tenderness, and swelling are the other signs of NF (7). Tense edema, ecchymosis, and pain disproportionate to examination are referred to as soft signs and can be observed in soft tissue infections other than NF and require further investigation to confirm NF diagnosis. However, presence of hard signs defined as hemodynamic instability, bullae, crepitation, and skin necrosis are the indicators of necrotizing soft tissue infection and seek immediate intervention (8). In fulminant forms, the patient is critically ill with signs of septic shock or multiple organ dysfunctions. The acute form of NF develops quickly and pain may be presented before cutaneous manifestations such as rash or blisters (9). However, some patients may not have visible skin lesions, similar to the current case (10). It is believed that the clinical judgment is always the most important step in diagnosis (10). This infection may first resemble cellulitis. In the current report, pain was disproportional to clinical findings and edema extending beyond the erythema was the important findings suggesting deeper tissue involvement (10). Group A Streptococcus spp., Entrobacteriaceae and Peptostreptococcus spp. are most common pathogens (7). Although blood culture may be only positive in approximately 30% of patients with necrotizing infection (11), each of these pathogens may have unique presentations or present as a comorbid. Evidence suggests causative organisms in most cases of NF. In the current case surgical procedure was not applicable and it was decided to treat the patient without debridement. According to the history of VZV infection and skin excoriation, streptococcal infection was considered as the most possible cause. Also, former use of nonsteroidal anti-inflammatory drugs (NSAID) strengthened the clinical suspicion toward Streptococcus spp. (12). The other factor suggesting streptococcal infection was the scaly skin. Vesicle, bullae, and blistering are more frequently observed with streptococcal toxin (12). Also, pain out of proportion to examination is a classical finding of streptococcal NF. Streptococcal toxic shock syndrome (TSS) is observed in half of the patients with streptococcal NF. It is reported that VZV infection increases the risk of developing streptococcal TSS (12). Although the final diagnosis should be made by tissue biopsy, which could not be done in the current case, and despite some controversial findings such as crepitation, it was relied on the probable diagnosis of streptococcal infection. Imaging modalities are important tools to determine the depth of infection. Deep tissue infection requires emergent surgical treatment. Other lesions involving only dermis and hypodermis can be managed by non-surgical treatments. Clinical findings and imaging modalities are helpful to distinguish these 2 conditions. Plain radiographs may only show soft tissue hyperdensity and thickening and is not sufficient for diagnosis. CT scan provides more details and is more helpful (13). Moreover, CT scan can also show deep collections (14). Although both superficial infections and NF cause reticular infiltration of hypodermal fat and skin thickening, the diagnosis is confirmed by the presence of deep tissue lesions. Asymmetrical fascial thickening and gas are 2 valuable findings in suspicious cases of NF (13). Magnetic resonance imaging (MRI) effectively documents soft tissue lesions and their distribution. MRI is sensitive to determine deep tissue invasion, but is not specific enough and the depth of infection may be overestimated (13). US is another imaging modality used in skin infections. US is mostly helpful in pediatrics. Key findings are thickened and distorted fascial planes with fluid accumulation in fascia and subcutaneous edema. Furthermore, similar to CT scan, detection of gas is of high diagnostic value in ultrasound scan (15). Surgical debridement of infected tissue within the 1st day of infection is the cornerstone of therapy (7). Treatment as NF is based on wide surgical debridement, antibiotic therapy, and cardiopulmonary stabilization. IVIg is recommended in GAS suspected infections or in the presence of streptococcal TSS (7). Young et al. suggested clindamycin plus antistreptoccocal antimicrobials as standard care. In case of clindamycin resistance; linezolid and daptomycin are preferred choices. They stated that hyperbaric oxygen, activated protein C and intravenous immunoglobulin were new treatments with uncertain values, which needed further evidence (7). Shirley et al. reported a case of NF in a 33-month-old child. Their case presented with right flank cellulitis, fever, nausea, vomiting, and dehydration. They started the treatment by intravenous flucloxacilline and cefuroxime. Similar to the current case, their patient’s fever remained consistent and did not respond to therapy at first. Also, skin involvement continued to develop (5). Similar to the current case, Sakata et al. used IVIG, but performed surgical debridement. They reported a 4-day-old female presented with fever, irritability, and dusky induration over the buttock and back. There was a 12-hour history of vaccination in buttock followed by rapid growing redness. Elevated CRP level and WBC and decrease in platelet level as well as toxic granulation and vacuolation in neutrophils were the remarkable findings. They used IVIG, vancomycin, tazocin and flucloxacilline. By performing a surgical debridement, they found extensive fascial and subcutaneous involvement without any skin necrosis. They used vacuum-assisted closure dressing for the wound (16). Administration of IVIG in patients with streptococcal NF is reported to be beneficial in critically ill patients by reducing the risk of extensive debridement, allowing more conservative surgical approach (17). The current case report supported previous studies on younger adults about aggressive medical therapy plus IVIG to treat NF without the need for immediate surgical intervention. Chapman et al. presented a 17-year-old case of group A streptococcal NF treated with invasive practices. They obtained their specimen from necrotic tissue of the thigh. As the infection was too extensive to be manipulated, they decided to treat the patient with penicillin, clindamycin, and IVIG plus hyperbaric oxygen therapy (18). Norrby-Teglund et al. reported 7 patients with severe soft tissue infection successfully treated with medical regimens and IVIG. Their treatment approach limited the need for immediate wide debridement in unstable patients (19). Although non-surgical approaches are reported unsafe and risky (4), surgical operations are not possible in all patients such as the current case (20). Due to patient’s condition, it was decided to treat infection medically. Vancomycin and meropenem were administered as antibiotic treatment for NF as well as IVIG and achieved clinical improvement (10). NF is a rare complication of VZV infection and could be lethal if misdiagnosed. Although it was not allowed to perform any surgical intervention without the willingness of the current case parents, it should be chosen based on clinical findings instead of pathological or surgical diagnosis. Although surgical debridement is the most common and preferred approach to treat NF following VZV infection, it is suggested that IVIG plus antibiotic regimen be applied in patients not able to undergo surgery or do not agree for biopsy. 1. Zerboni L, Sen N, Oliver SL, Arvin AM. Molecular mechanisms of varicella zoster virus pathogenesis. Nat Rev Microbiol. 2014;12(3):197-210. doi: 10.1038/nrmicro3215. [PubMed: 24509782]. 2. Cameron JC, Allan G, Johnston F, Finn A, Heath PT, Booy R. Severe complications of chickenpox in hospitalised children in the UK and Ireland. Arch Dis Child. 2007;92(12):1062-6. doi: 10.1136/adc.2007.123232. [PubMed: 17991685]. 3. Ziebold C, von Kries R, Lang R, Weigl J, Schmitt HJ. Severe complications of varicella in previously healthy children in Germany: a 1 year survey. Pediatrics. 2001;108(5):79. [PubMed: 11694663]. 4. Bingol-Kologlu M, Yildiz RV, Alper B, Yagmurlu A, Ciftci E, Gokcora IH, et al. Necrotizing fasciitis in children: diagnostic and therapeutic aspects. J Pediatr Surg. 2007;42(11):1892-7. doi: 10.1016/j.jpedsurg.2007.07.018. [PubMed: 18022442]. 5. Shirley R, Mackey S, Meagher P. Necrotising fasciitis: a sequelae of varicella zoster infection. J Plast Reconstr Aesthet Surg. 2011;64(1):123-7. doi: 10.1016/j.bjps.2010.03.031. [PubMed: 20570582]. 6. Mori T, Tokuhira M, Takae Y, Mori S, Suzuki H, Abe T, et al. Successful non-surgical treatment of brain abscess and necrotizing fasciitis caused by Bacillus cereus. Intern Med. 2002;41(8):671-3. [PubMed: 12211541]. 7. Young MH, Aronoff DM, Engleberg NC. Necrotizing fasciitis: pathogenesis and treatment. Expert Rev Anti Infect Ther. 2005;3(2):279-94. doi: 10.1586/14787210.3.2.279. [PubMed: 15918785]. 8. Hussein QA, Anaya DA. Necrotizing soft tissue infections. Crit Care Clin. 2013;29(4):795-806. doi: 10.1016/j.ccc.2013.06.001. [PubMed: 24094377]. 9. Roje Z, Roje Z, Matic D, Librenjak D, Dokuzovic S, Varvodic J. Necrotizing fasciitis: literature review of contemporary strategies for diagnosing and management with three case reports: torso, abdominal wall, upper and lower limbs. World J Emerg Surg. 2011;6(1):46. doi: 10.1186/1749-7922-6-46. [PubMed: 22196774]. 10. Stevens DL, Bisno AL, Chambers HF, Dellinger EP, Goldstein EJ, Gorbach SL, et al. Practice guidelines for the diagnosis and management of skin and soft tissue infections: 2014 update by the infectious diseases society of America. Clin Infect Dis. 2014;59(2):147-59. doi: 10.1093/cid/ciu296. [PubMed: 24947530]. 11. Al Shukry S, Ommen J. Necrotizing Fasciitis - report of ten cases and review of recent literature. J Med Life. 2013;6(2):189-94. [PubMed: 23904882]. 12. Morgan MS. Diagnosis and management of necrotising fasciitis: a multiparametric approach. J Hosp Infect. 2010;75(4):249-57. doi: 10.1016/j.jhin.2010.01.028. [PubMed: 20542593]. 13. Malghem J, Lecouvet FE, Omoumi P, Maldague BE, Vande Berg BC. Necrotizing fasciitis: contribution and limitations of diagnostic imaging. Joint Bone Spine. 2013;80(2):146-54. doi: 10.1016/j.jbspin.2012.08.009. [PubMed: 23043899]. 14. Wysoki MG, Santora TA, Shah RM, Friedman AC. Necrotizing fasciitis: CT characteristics. Radiology. 1997;203(3):859-63. doi: 10.1148/radiology.203.3.9169717. [PubMed: 9169717]. 15. Fugitt JB, Puckett ML, Quigley MM, Kerr SM. Necrotizing fasciitis. Radiographics. 2004;24(5):1472-6. doi: 10.1148/rg.245035169. [PubMed: 15371620]. 16. Sakata S, Das Gupta R, Leditschke JF, Kimble RM. Extensive necrotising fasciitis in a 4-day-old neonate: a successful outcome from modern dressings, intensive care and early surgical intervention. Pediatr Surg Int. 2009;25(1):117-9. doi: 10.1007/s00383-008-2289-3. [PubMed: 18982332]. 17. Low DE. Toxic shock syndrome: major advances in pathogenesis, but not treatment. Crit Care Clin. 2013;29(3):651-75. doi: 10.1016/j.ccc.2013.03.012. [PubMed: 23830657]. 18. Chapman SJ, Opdam H, Donato R, Johnson PD. Successful management of severe group A streptococcal soft tissue infections using an aggressive medical regimen including intravenous polyspecific immunoglobulin together with a conservative surgical approach. Scand J Infect Dis. 2006;38(8):742-3. doi: 10.1080/00365540500372960. [PubMed: 16857634]. 19. Norrby-Teglund A, Muller MP, McGeer A, Gan BS, Guru V, Bohnen J, et al. Successful management of severe group A streptococcal soft tissue infections using an aggressive medical regimen including intravenous polyspecific immunoglobulin together with a conservative surgical approach. Scand J Infect Dis. 2005;37(3):166-72. doi: 10.1080/00365540410020866. [PubMed: 15849047]. 20. Wang JM, Lim HK. Necrotizing fasciitis: eight-year experience and literature review. Braz J Infect Dis. 2014;18(2):137-43. doi: 10.1016/j.bjid.2013.08.003. [PubMed: 24275377].